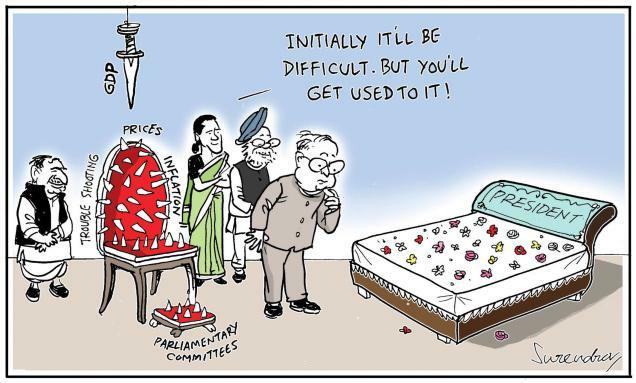 With the departure of Pranab, a prominent position in congress is vacant and also he leaves the GoM on various issues. So it is time to invent new leaders for the congress , and new ministers for the cabinet. In the next cabinet reshuffle, it is most likely that young ministers like Jitin Prasad, Sachin Pilot, Scindia will be given cabinet ranks and it will be interesting to see how young ministers work. With the backdoor deal on the DA case, being struck between Congress and Samajwadi Party, the news is very clear. SP wants to consolidate on its Akilesh Yadav Government in Uttar Pradesh, for which it needs financial assistance from the centre. This ensures UPA government is not going to be toppled and the Lok sabha will complete its full term. This will give the Congress a free hand in pushing through the long pending reforms . 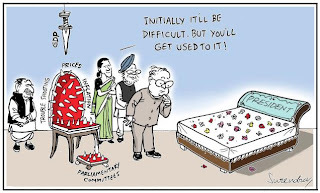 With the arrival of "self seeking politicians discarding ethics" , Mamata Banerjee has lost her hold on UPA. She was instrumental in ensuring that the reforms hit a road block in the last 3 years. Congress should be more than happy to get rid of her. It will be interesting to note how long will Mamata remain in UPA, because once she comes out of UPA, West Bengal is not going to get the funds that they get now. Starting from FDI in retail and rollback in railway budget, she has tried to project herself as a leader of the common man, and has been a big head ache to the Government. Didi's political moves from now on, will have great impact on her future in national politics ! They cheered that the rift was wide open in their opposite camp ; they smelled the chances of a mid term election. But very soon, he tables turned on them ! With the inability to reach a consensus on presidential polls inside its alliance, NDA is in deep trouble. With the Nitish kumar- Narendra Modi rift wide open, and with lots of Prime ministerial aspirants in its top brass, troubles are multiplying for NDA every day. If Modi claims to be the prime ministerial candidate citing his success in Gujarat, Shivraj Chauhan may brace himself for the same citing his possible re-election in MP after the assembly polls earlier next year. It is miserable that a person like Advani with 50 years of experience in Parliament is rendered powerless, and that he is seen as an impediment by his own partymen. With a lack of sense and direction , and infighting in BJP, NDA might dissolve, leading to a Nitish-Jayalalitha-Patnaik-YSR-Mamata alliance, leading to a deep stability crisis, post 2014.